One big thing I’ve been doing lately is trying to cook from my cookbooks more. I have a huge cookbook collection that I covet, yet sadly they are just sitting pretty on a shelf in my kitchen the last couple of years. How did that happen? (The internet, that’s how). Well, things are changing. My kids have heard me talk about how I miss cooking from my cookbooks and they’ve been pulling some off the shelves and onto the kitchen table lately so that we can look through them and find something to try. This has been fun for all of us! 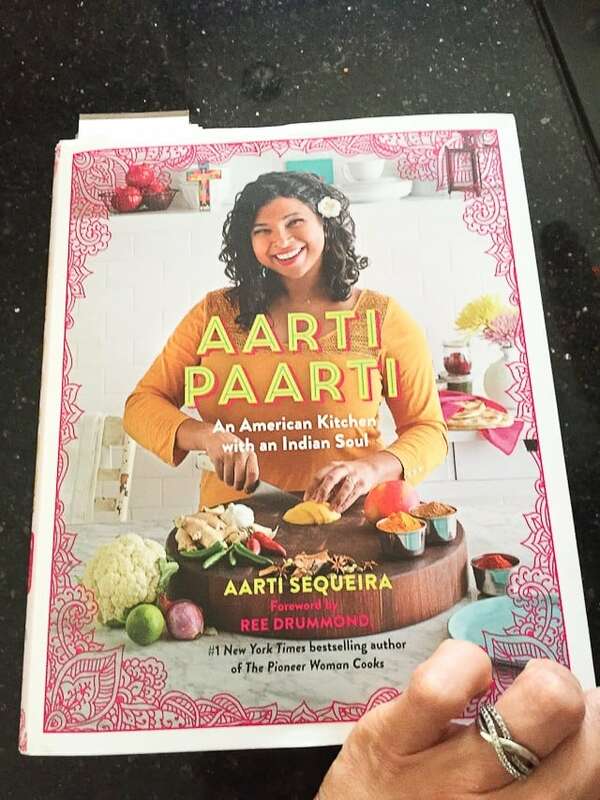 I bought this cookbook last year when it came out – Aarti was one of my FAVORITE Next Food Network Star contestants and I watched her show regularly after she won her season (did she win her season? I can’t remember now). Total sadness that it is no longer on air. My daughter loved her show too, and my husband and I pretty much were introduced to Indian food because of her (LOVE). 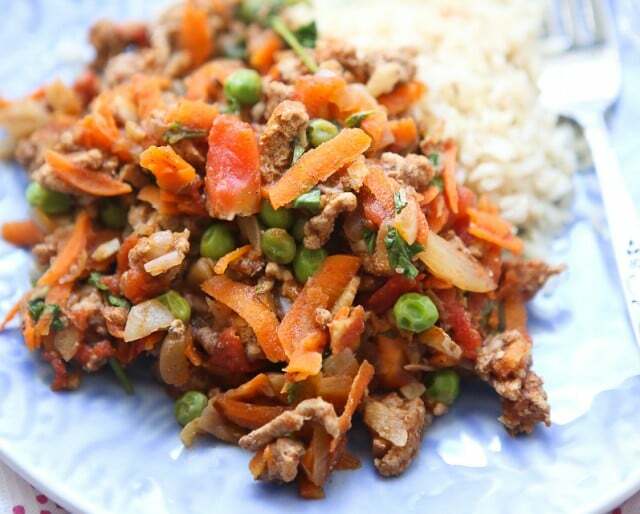 This recipe for Kheema comes from her cookbook and made it to our meal plan this past week. We loved it. 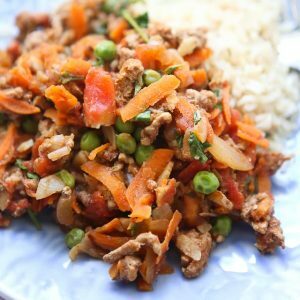 I really only changed a few things in the recipe – I swapped ground turkey for ground beef and added a shredded carrot (because I am obsessed with adding shredded carrot to everything lately). 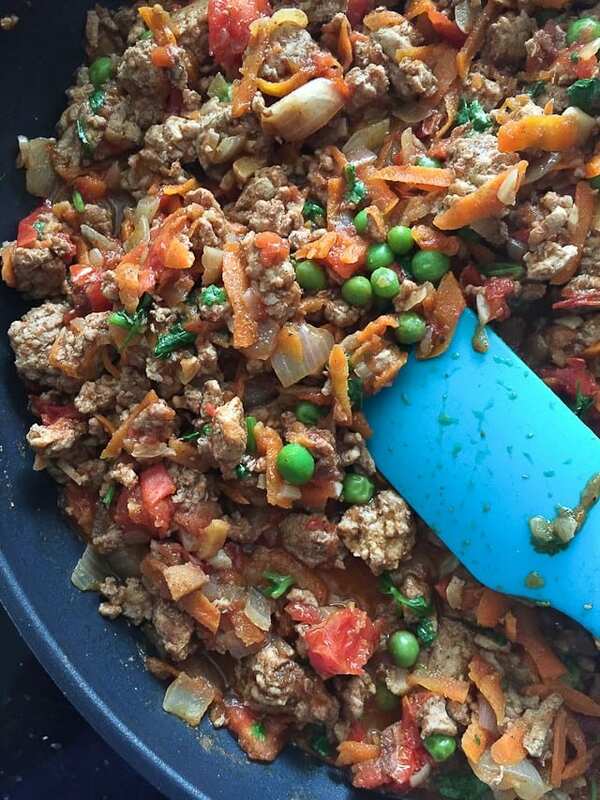 Kheema is traditionally cooked with lamb and served with Indian flatbreads. Next time I make this, I will try it with beef. I also threw in a pinch of ground cinnamon because this girl got me hooked on adding cinnamon to savory dishes (have you tried her Lebanese Beef and Green Beans? So. Good.). The result was absolutely delicious served over brown rice for a weeknight dinner. Personally, I was wishing I had warm Indian flatbread like chapatis to scoop it up with instead of the rice…maybe I’ll personally challenge myself to that soon! 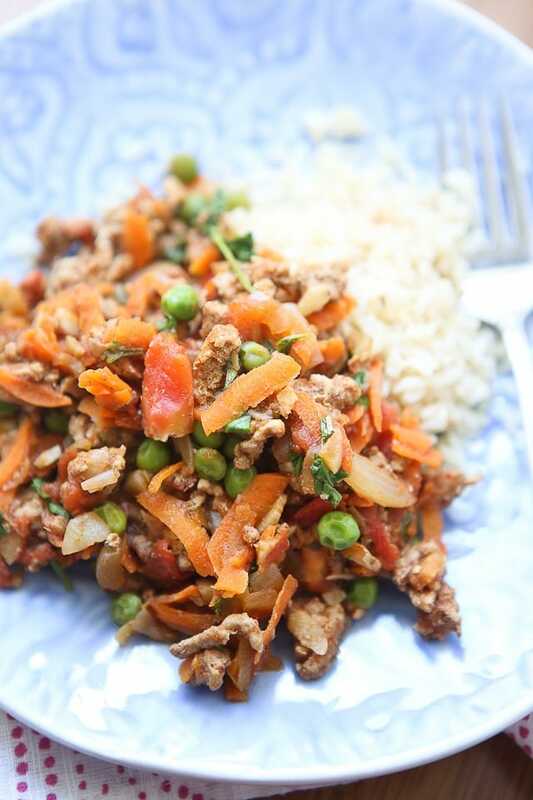 Filled with warm spices and veggies, this recipe is great served over rice or scooped up with pita or naan bread. In a large nonstick skillet, heat oil over medium heat. Add onions to pan and cook until soft, about 5 minutes. Add garlic and ginger and stir, cooking for a minute longer. Add spices and cook for one minute, stirring constantly so that they don’t burn. Add ground turkey to pan and cook until brown and crumbled, about 5-7 minutes. Add shredded carrot, chopped tomatoes and water. Season well with salt and pepper. Simmer meat and vegetable mixture in partly covered pan for about 10 minutes, until liquid is absorbed. Stir in peas and cook for 5 minutes. Stir in vinegar and cilantro and taste for salt and pepper. Serve over cooked brown rice. Recipe adapted from Kheema in the Aarti Paarti cookbook.